for evaluation and sell the rest. We do our best to find a good fit for each kid. $400 is the usual price. Exceptions will be mentioned in the Comments. Click on the heart below to open up a PDF version of our 2018 Kidding Schedule for viewing or printing. 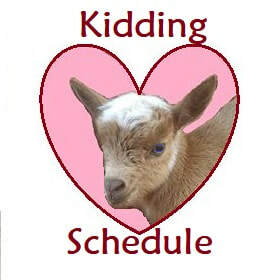 From the Kidding Schedule, you can get back to our web site, and the individual goat pages, by clicking on the goat's name.